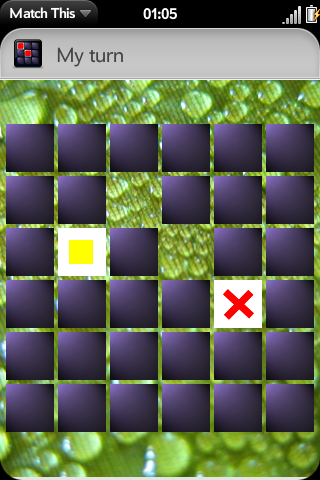 This is a preview of my free match-tiles game. It's a game you against your Pré. When the game launches you select who starts the game. After it tiles are uncovered by tapping the tile. When you have a matching pair you have another try. If you miss your Pré gets its chance. At the moment 2 fixed tile sets are included. Three difficult levels and 2 different board sizes allow the right challange for young and old. If you want you can select your own background image. The game works in portrait and landscape mode. The game is donation ware, if you like it (what I hope) please follow the donation link in the Help menu.